The pen and pencil are the basic armor that artists would use. Most of us started with this and would even pair it with erasers to fix mistakes. Artworks done by hand are really awesome for they exude a sense of personality and originality. 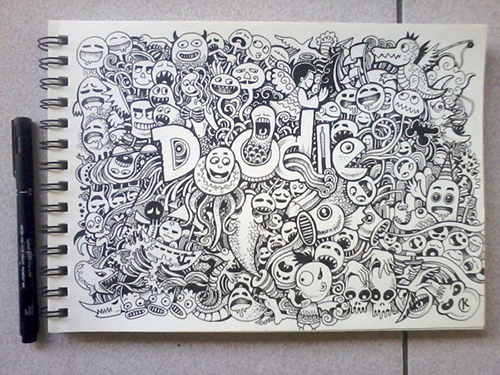 Doodles are one of those types that can be created using the pencil, pen and paper. Doodles are scribbles which are referred as unfocused or unconscious drawings because the artist would do it while his mind is occupied with other things. But there are also some doodles that are well-thought of depending on the kind of project an artist is working on. 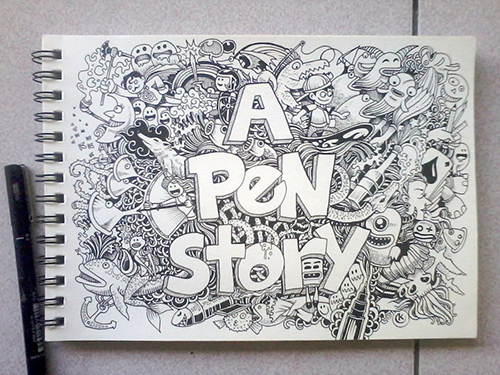 Today, we will be featuring an artist that had impressed the world with his talent in creating doodles. 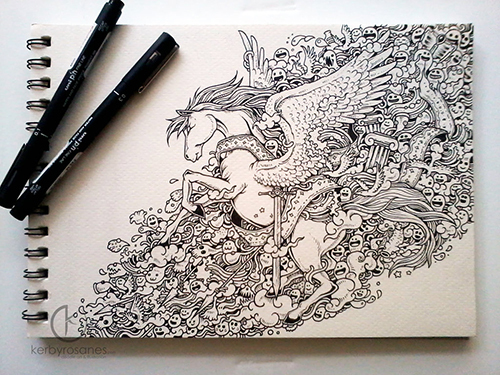 He is Kerby Rosanes, a 22 years old freelance illustrator from the Philippines. He is a graduate of Information Technology but preferred to enter the creative world with his love and passion for doodling. Kerby defined doodling as “a spontaneous drawing paying attention to details and little elements combined”. We were given the chance to look beyond the Sketchy Stories of Kerby’s doodles. You will surely be inspired after reading our interview with him. Naldz Team: How and when did you start making doodles? 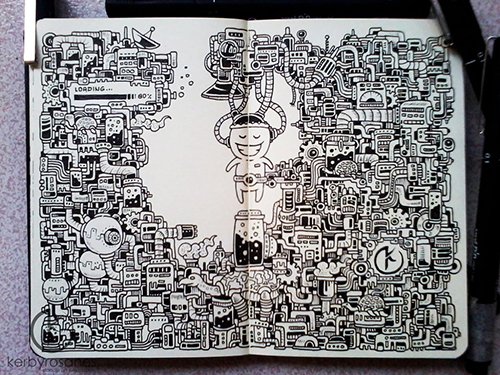 Kerby Rosanes: I started doodling last year. I’ve been into drawing since I was a kid and I’ve tried so many disciplines like realistic sketching, cartooning, mural painting and even comic strip drawing. But it was in doodling that I felt more fun and creative. The idea of drawing with just a pen and paper is perfect for me since I don’t have enough patience in coloring or to sketch everything with pencil then erase them right after. It was also last year since I started to work full-time as a marketing specialist and a designer in a local company. Getting into doodling is the least I can do for my art, considering I don’t have that much spare time because of work. I draw anywhere with my pocket notebook, when there is an opportunity. Then a doodle style was born, never realizing it will be that much appreciated by people of all ages across the globe. Naldz Team: Do you have “creative patterns” that you always do while working? 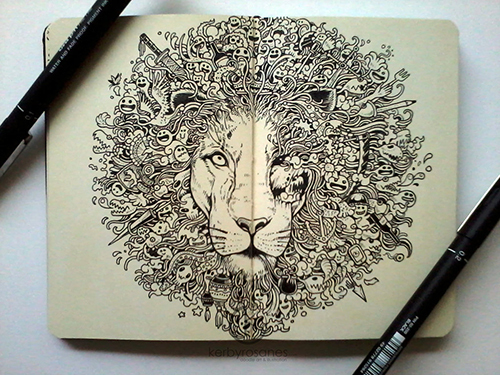 Kerby Rosanes: None actually for my personal doodles. Whenever I thought of a nice idea, I just grab my pen and sketchbook then start doodling. But for commissioned works, the process starts with understanding the creative brief given by the client. After few crazy conversations and when a solid idea is agreed, I start finding reference image online. Create a draft sketch. If the draft was approved by the client, the fun part begins. If required by the client, I scan my ink doodles and clean them up using Photoshop. Naldz Team: Can you describe the time when you first realized that creating doodles was something you want had to do? 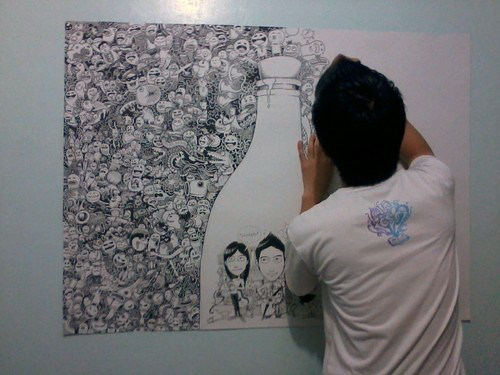 Kerby Rosanes: It was when I started doing every single night after a busy work day at the office. Doodling just get me out of the stressful day and help me get a good night sleep. When some of my works get more and more online recognitions, then that’s the time I decided to continue it today and for the time being. Naldz Team: Do you think it is important to stay focused? How do you keep focused? 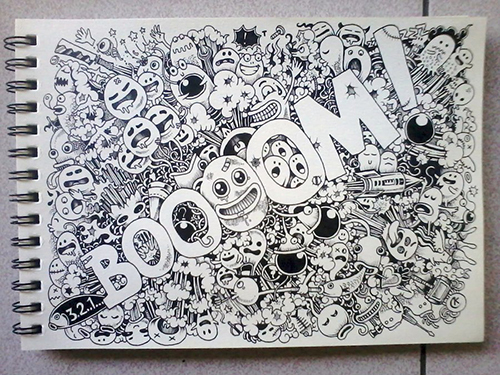 Kerby Rosanes: For this type of art, it is not really necessary to stay focused at all. Whenever I’m doing a personal doodle, I just let my mind and hand get through it. Every unfocused line or shape is a new opportunity for a new doodle character. It always surprises me when I create something awesome without even planning it out from the beginning. However, the “state of being focused” is applied when I am doing the work for a particular client. Since every single element was planned, there is no room for mistakes. When working on a commissioned project, I stay focused by listening to good music and some snacks on the side. Naldz Team: How far have you reached through your doodles? 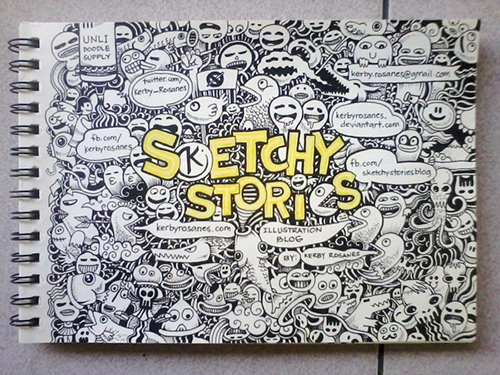 Kerby Rosanes: Well so far, my doodles have opened a lot of opportunities for me locally and internationally. I got to work with clients from different countries ranging from personal works, print, clothing and even branding and packaging. The sense of joy and fulfillment whenever I get a work well done for another happy client is priceless. Moreover, I got a lot of exposure from different design and art blogs and on some international magazines and journals. I got to meet and get in touch with other awesome doodlers locally and on various online art communities. So many great things that happened for a year of doodling – which were totally unexpected from the very beginning. Naldz Team: Where do you get your creative inspiration from? 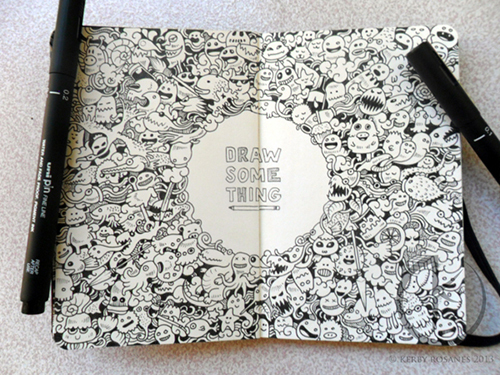 Kerby Rosanes: From a lot of things. Watching Anime, good films, cartoons, reading comic books, browsing other artists’ works, listening to music and from anything creative that catches my attention. For instance, I saw a random guy at the mall with an “anchor” tattoo on his left arm. When I got home, one of my favorite doodles called “Into The Deep” was born. I also get a lot of inspiration from the creative people I connect with while writing content for a graphic design blog called You The Designer. I usually write about interview articles featuring designers and artists from different creative fields. Knowing their stories and creative processes is a huge inspiration for me. Naldz Team: Who are your doodle heroes? Kerby Rosanes: The ink works of Mattias Adolfsson and Johanna Basford has been an inspiration for me as much as the unique style of the legendary Keith Haring and the graphite drawings of Alexis Marcou. There are a lot of great illustrators out there that I idolize but my ultimate doodle hero would be my mother. She’s the very first individual who made me realize the importance of mastering the skills in drawing and to always see the creative side of everything that I do. Naldz Team: What is your most memorable project so far? Kerby Rosanes: Tough question. Hmmm..I love them all but I must say the project I did for a great family from United Kingdom earned a special spot in my heart. It was a “doodled family tree”. 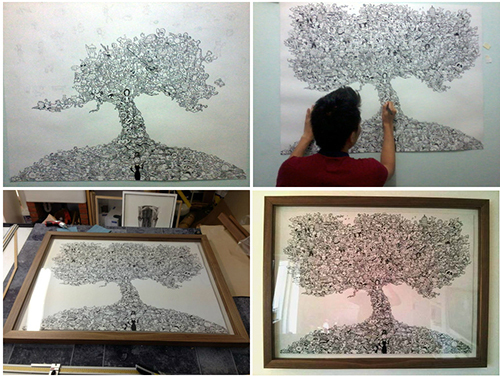 The idea was to create a doodle artwork shaped into a tree profile with elements that best represent the family members like favorite movies, hobbies, fictional characters, etc. I had so much fun doing it even though I endured a couple of sleepless nights to finish it. Naldz Team: What are you trying to communicate with your doodles? 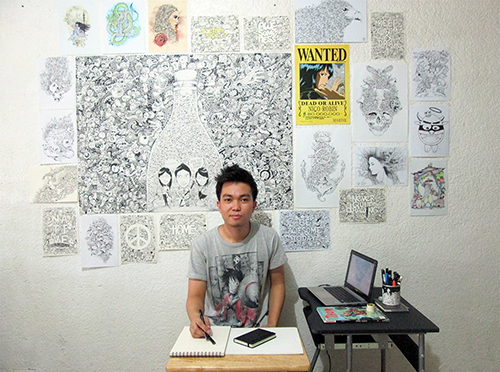 Kerby Rosanes: Each of my pieces has a special message. But generally, I just want to share all the fun I had while making them. Some of my works might look like a serious drawing at first glance but when seen closely, lots of happy faces and fun characters are hidden – most likely representing what I feel when I’m working on them. It shows that when you enjoy doing something, you’ll come up something awesome out of it. Naldz Team: How do you work on the story behind your sketches? 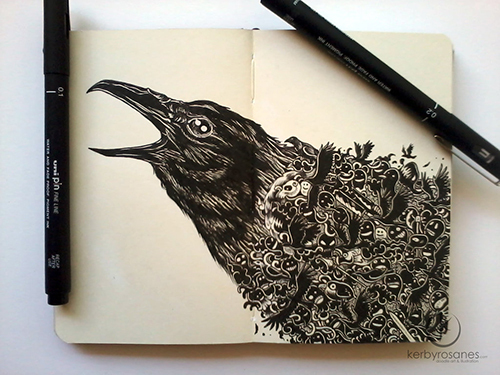 Kerby Rosanes: Most of my personal works are based or inspired by personal experiences. It’s pretty simple, when I’m having a bad day, I usually include little skulls or sad faces within the whole artwork. But as much as possible, I would love to reflect fun and happiness with my work by placing happy faces and characters no matter how serious the stories behind them. Naldz Team: Was there ever a time that you have doubted your creative ability? How did you overcome it? 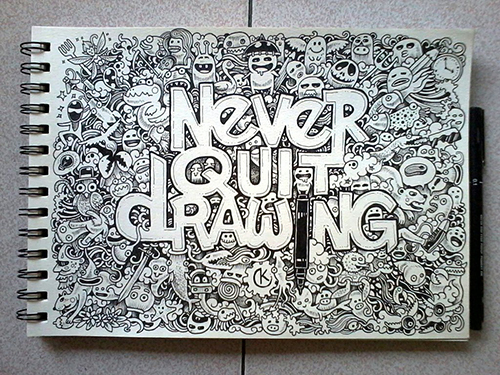 Kerby Rosanes: Yes of course, many times actually. Whenever I’m faced with that kind of “doubt” or “block”, I just drop my pens and take a break. Breaks can be weeks or even months of not doing anything related to drawing. Once I feel really missing my craft, that’s the time I get back to drawing with enough creativity and eagerness to create something awesome without any doubts or creative block. Naldz Team: Have you experienced being criticized? How did you deal with it? Kerby Rosanes: Yes, sometimes. Dealing with them is easy. Take in those constructive and well- reasoned criticisms/opinions and just ignore those destructive ones. The creative world is filled with those so you just have to go with the flow. Naldz Team: What are the things that you enjoy doing aside from making doodles? Kerby Rosanes: As mentioned earlier, watching movies and reading comic books are few things I enjoy doing when I’m not in front of my drawing table. Hanging out with good friends from time to time to catch up with things either an out of town trip or long nights of Anime marathon also helps. Naldz Team: What tips or advice can you give to those who want to try drawing doodles like you? Kerby Rosanes: Be patient. Doodling comes naturally so there’s nothing to worry about if your works are not as good as what others can do. If you are serious of making it a career in the future, work hard to develop your own style. Experiment. Always try to see the creative side of things. Sleep and follow not your dreams but your passion. Everyone needs to recharge sometimes like the one in this doodle. Look at all the mechanical details in this drawing! A doodle showing how exciting and fun an adventure can be! A commissioned work for a Malaysian featuring a Pegasus. This one seems like a word of encouragement to “draw something” each day. Kerby said this is “probably the most challenging doodle he did for his moleskin sketchbook”. This is what you call pure doodling- merely expressing one’s creativity with the pen. 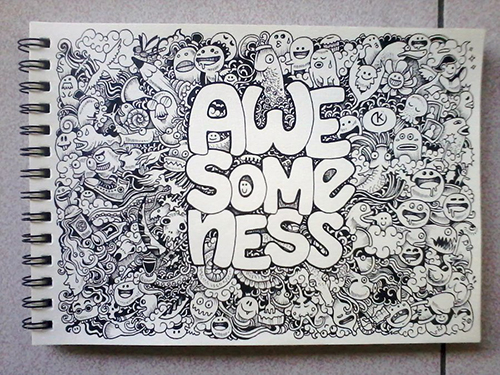 Showing one’s awesomeness through happy doodle characters. These doodles seem to look lively. Partying eh? 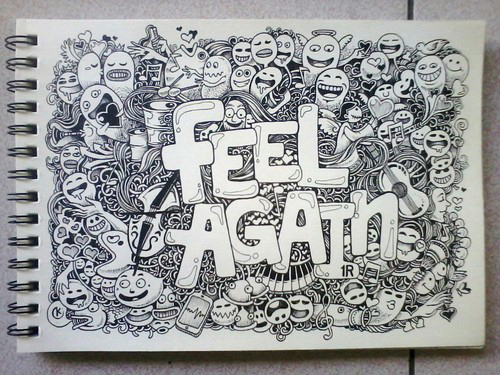 A doodle fan art for an album cover of OneRepublic’s single Feel Again which is Kerby’s most favorite song. Telling stories with pen, ink and a sketchbook. If you look closely, there are so many characters in it that can tell different stories. 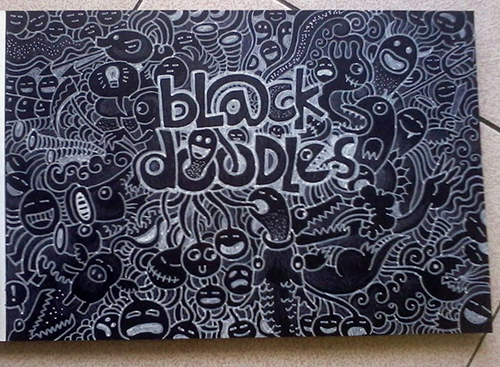 Kerby put all negative vibes into this doodles using a black sketchbook and white pen. He expressed all his negativities in this work. 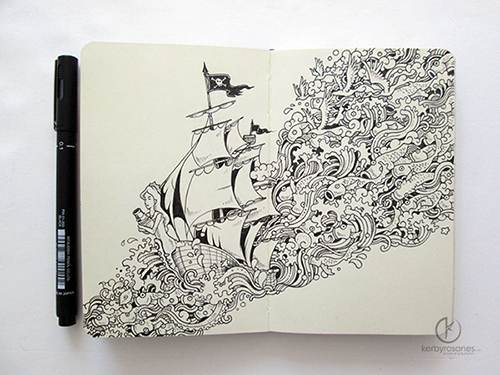 The details in Kerby’s doodles are amazingly impressive! Every stroke of his pen tells a different story. Upon examining every element in his doodles, you will be able to create different stories in your mind – fun, sad and deep stories. If you want to see more of Kerby’s Sketchy Stories, you can check his website where you can also see some personal notes that he adds for every project he is working on. Wow,this is a cute artworks Kerby! 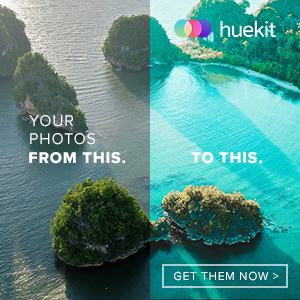 It’s nice to see a Filipino artist,featuring here in your site. 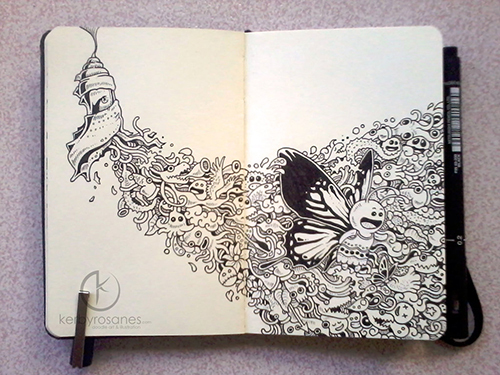 Unexplained feeling I felt when I see this post..Rosanes,you have a powerful hand! Do Mr. Rosanes sell his artworks?